Making homemade candy is one of my favorite Christmas traditions. It started with my Grandma when I was little, and is now something I treasure sharing with my own children every year! One of the best parts of the holidays is that there’s pretty much a free pass to eat tons of treats and Christmas Cookies, but nothing beats a batch of fresh Homemade Candy! If you ever wonder how to make your own homemade candy, this is the blog post for you! We are sharing two dozen (plus) recipes of candies, and some tips, to sweeten your holiday, as well as the rest of the year. There is just something extra special about mint-y green! Whether you are hosting a Grinch party or just wanting to liven up your recipe with a bit of color, Dark Chocolate Mint Bark pieces are extra fun and delicious – via Browneyed Baker. Chocolate potato chips… and you thought that plain potato chips were addicting! If you are as obsessed with potato chips as we are, then buckle up for these – via Baby Center. Chocolate is full of antioxidants. Mix it with another superfood for a tasty and healthy treat in Pomegranate Bark, from VanillaCrunnch. Use your crockpot to make this Triple Chocolate Fudge from Simplistically Living…do I need to say more? Melted chocolate with antioxidant-filled trail mix on top is a healthy candy treat that will provide guilt-free snacking this time of year – via Simply Taralyn. 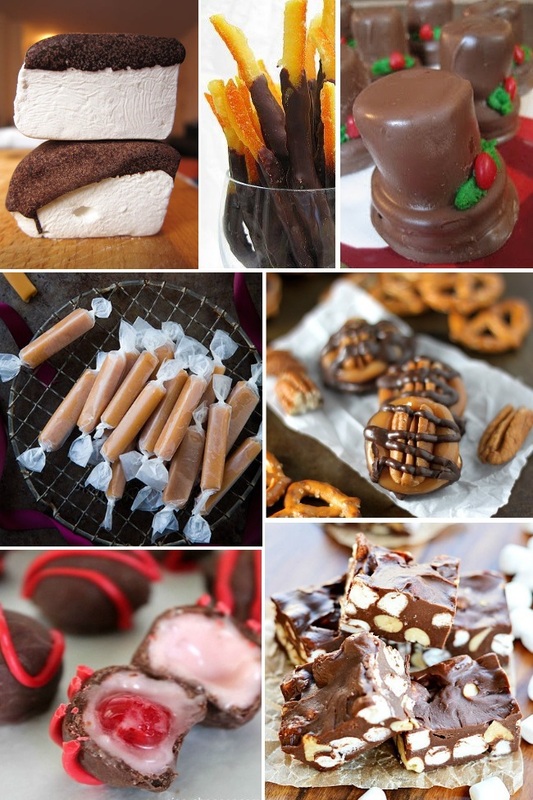 Chocolate, salty, and mint are some of the hallmark flavors of Christmastime. Liven up all things traditional and add the tang of sticks of Orange Nut Toffee to your Christmas Treats, with this yummy treat from Better Homes and Gardens. These Clear Sprinkled Pops, from Just a Taste, are pretty on their own, but when you add festive sprinkles, they look so bright and cheery! Dark chocolate on the bottom, tasty vanilla, and adorable sprinkles on top! This Birthday Sprinkle Bark is a must-have for any part – via Ashlee Marie. All the kids love Minecraft, so you’ll win the parent of the year award with Minecraft Creeper Chocolate, via Simplistically Living. It doesn’t get much better than combining some of your favorites into one bite! Layer Oreos with a peanut butter cup, and dip the whole thing into chocolate with this delicious homemade candy recipe from Daily of the Day! Only six ingredients! 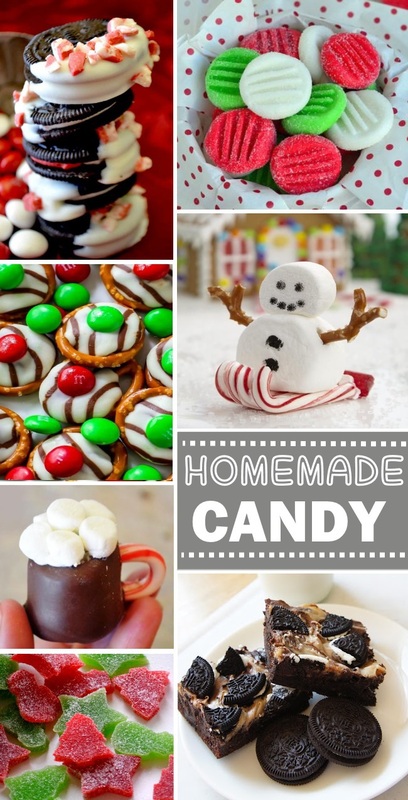 This candy recipe from Serendipity Mommy is a must for any gathering. While we love the vintage look of the rock candy, the taste is definitely up-to-date and delicious as can be! This English Toffee recipe from Shugary Sweets is so easy to follow! We love her idea of using a brownie bite pan. No more breaking toffee into tricky pieces, this way, each little cube of toffee is perfect! Crunchy toffee is amazing! This candy recipe from The Yummy Life is just the right touch of chocolate and nuts for a perfectly old-timey treat. Grab a pack of Oreo cookies, dip them in white chocolate, cover them with gorgeous sprinkles, then put them on a stick for easy, mess-free eating, with this awesome candy recipe from Makoodle. Just when you thought Oreos couldn’t get any better… learn how to dip them in chocolate and add just enough peppermint pieces to make them gorgeous with this delicious candy recipe from Pink Cake Plate! There’s something extra great about homemade peppermint patties. We love this homemade candy recipe from Mom on Timeout, because it’s adorable and tasty! Stripped Pretzel bites, from Sally’s Baking Addiction, are easy to make, and look super pretty on a Christmas Cookie plate. They only take a few seconds to make, too! Speaking of pretzels, start with a mini pretzel, add their amazing caramel sauce, a pecan half, and then top it all off with some chocolate, and you have Turtle Pretzels via Baker By Nature. Some things are just too cute for words! This chocolate-dipped marshmallow mug from Bird’s Party tops our “adorable” lists, with its peppermint handle, and the mini marshmallows on top. You will definitely be the talk of any Christmas party when you bring these! These gummy treats are made with applesauce and gelatin mix. With so many color, flavor and shape options, these homemade gumdrops from Mom On Timeout would be fun treats to decorate your gingerbread house with, or to eat during any time of year! Homemade marshmallows are THE BEST! 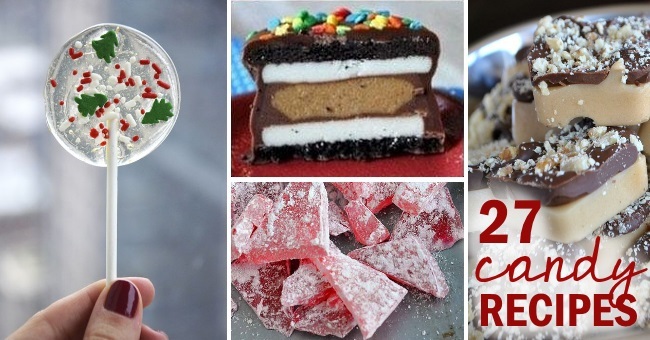 I can’t wait to put this yummy homemade candy recipe from Me So Hungry into a mug of hot cocoa! You don’t have to spend all day in the kitchen when you make yummy caramel sticks! Don’t worry, we won’t tell your relatives that it was microwave-made! 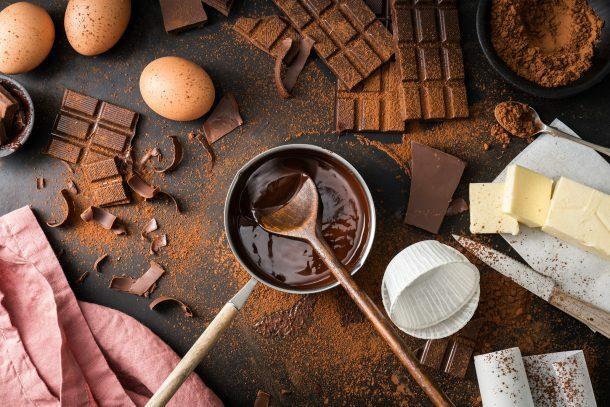 Let’s be real, this recipe had us at “chocolate-covered”, but these gorgeous truffles take it to the next level! The inside of this yummy homemade candy recipe from Cincy Shopper is made with real cherries, as well as a tasty cherry-flavored cream filling. Yummy! Kisses, Pretzels, and M&Ms, oh my! This salty-sweet combination found in Rocky Road Fudge is always a crowd pleaser, and they are so easy to make! Even the smallest of kiddos can help stack the treats together to make this yummy, bite-sized dessert from A Pumpkin & A Princess. Another version from A Pumpkin & A Princess is Rocky. Road. Fudge. Those three words really speak for themselves. The crunchy, the chewy, the CHOCOLATE. The only problem with this recipe is how quickly the goods seem to disappear after you make them! 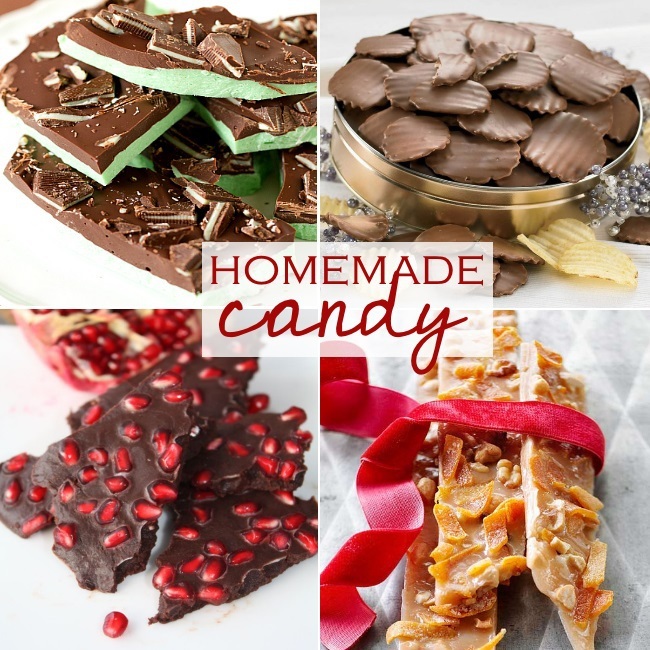 Making your own homemade candy can seem overwhelming, but its just like anything else, with practice, you will get better! Here are some pro tips to help you on your way to becoming Willy Wonka! How Long Will Homemade Candy Stay Fresh? This depends on the ingredients that you use, as well as how well you package it. The first and most important step is making sure that you store it in an airtight container. I love these OXO containers because the lids are easy to get on and off, but they still really keep the air out! If you package your homemade candy properly, it can last up to 2-3 weeks! Ugh! How Do I Keep My Candy From Sticking To The Pan? I have an almost unhealthy love affair with these Wilton candy parchment sheets. The best part is that they are pre-cut to fit most cookie sheets. It might seem a little basic or first-world to pay a little extra when you could just buy a box of parchment paper, but when you are up to your elbows in fudge, can’t find the scissors, or are on your third batch of whatever you are making, these babies will be your best friend! So… How Do I Wrap Homemade Candy? I’m glad you asked! circling back to my first tip, you want to make sure you always store your homemade candy properly so that you can get the longest shelf life out of it. There are also festive occasions when you might want to wrap your candy in a fancy way. You can use anything from saran wrap, to treat bags, to boxes! I love using boxes, and then wrapping them in paper that corresponds with the holiday we are celebrating! Pro Tip # 1 Believe in Yourself! You’ve got this! Half the fun is in the journey, and learning different techniques! Don’t get too upset if you botch the first batch or two, we’ve all been there! FOLLOW US ON FACEBOOK FOR MORE YUMMY RECIPES! My kids Love when we make this kind of treats at home.This such a good idea.